Tell any non-runner that you spent your weekend running and sleeping in a van and they look at you like you’ve lost it, but it was one of the best weekends of my life! I’m excited to be running the Chase again this year. Think an overnight relay is in your future or just want to learn more? I’m here to tell you the basics about these wacky races and how they work. Oregon’s Hood to Coast Relay has the distinction of being the oldest overnight running relay race, established in 1982. You may have even seen the documentary about it! Overnight relays are a rapidly growing field. According to RelayGuide.com, 56 relay races are 150 miles or longer and another 10 are 100-150 miles. You can find one in any state and just like with any other race, the size of the field varies from race to race. Most teams are 12 runners, although a few attempt it ultra-style with just six runners. One runner is designated as the “captain”. What that means is up to your team dynamics, but they are the official point person for when relay officials are communication information. Some teams divvy up the driving duties amongst the runners, but I highly recommend recruiting one or two dedicated drivers for your team. Most races offer different divisions for teams based on age and gender. Some even have spots dedicated for charity and corporate teams. The distance is divided into a set number of legs (usually 36), and for non-ultra teams, each runner is assigned three legs. The team will always run in the same order: i.e., I hand off to Salty, she hands off to Pepper, etc. Most overnight relays are point-to-point, so teams travel the roads in vans or other large vehicles. Unlike marathons and other road races, overnight relays are not run on a closed course. To spread out the van and foot traffic on the roads, and so that the finish line can be open for a shorter window of time (keeping race costs lower), teams are assigned staggered start times. These are usually based on estimated finishing times, but may be randomly assigned. For a 12-person team, runners are divided into two vehicles; just one of these is “active” at any given point. The active van has the runners who are currently running their legs. While Runner 1 is running, the van drives to the next exchange point so Runner 2 can get ready, and to pick up Runner 1 once they’re finished. This process is repeated up through the end of Runner 6’s leg, at which point the second van begins active van duties. Each van will be active three times during the race. You definitely won’t get a full night’s sleep during an overnight relay. You may catch some zzz’s in the van or in a designated sleeping area (like a field or high school gym). Some teams make use of friend’s (or friends of friend’s) houses along the way, or even opt to get hotel rooms. 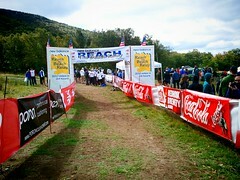 Once your final runner crosses the line, that’s when the post-race party begins! An overnight relay is truly a unique experience. Sure, on the surface it’s about running, but it’s really about the memories you make as you travel those miles with your team. You will use a LOT of portapotties during your adventure. Coming up with a team name is half the fun! These range from cute to funny to the double entendre-filled. I think my favorite I’ve ever seen was “I Need to Get Smarter Friends”! If you want to do a relay but don’t have like-minded friends, don’t worry. Just check the Facebook page or web site of the relay you’re interested in. Many teams have members drop out as the race gets closer due to injury. If you don’t know your team or know them well, you will before the end of your race. Sharing such close quarters for over 24 hours is a bonding experience! Your van will stink. There’s really no way of getting around that. Be extra nice to your driver! They have possibly the hardest job, since they are dealing with 6 sleep-deprived runners asking them all kinds of questions. Be nice to your captain! Their job is pretty hard, too. During the first few exchanges, everyone gets out of the van to greet the incoming runner and cheer the runner who’s starting their leg. That crap goes out the window at 3 a.m.
Have you ever run an overnight relay? If not, is it something that appeals to you? I was lucky enough to get asked to join a team to do this year’s Hood to Coast back in August. It was my first relay and it was awesome! We are now just trying to figure out which one to do next! Jen, I would love to do Hood to Coast! Although the size and reports of traffic backups intimidate me a little bit. Keep us posted on which one you decide to do! RelayGuide.com is a great resource for narrowing it down. 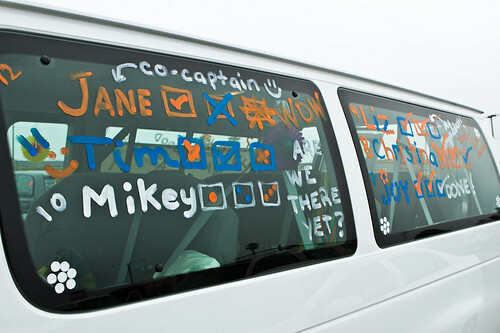 You should also consider doing a Ragnar relay (we did the TN one) – it was SO much fun! Ragnar has the 200 mile relays all over the country! And if you are in the Arkansas area, there is a new relay called “Outback in the Ozarks.” We are about to run it next week – can’t wait!